Although I am not a vegetarian and I love my Chocolate Chilli, it is always nice to try a new recipe and this hearty vegetarian chilli is really delicious , easy to make and is an ideal lunch or supper dish. 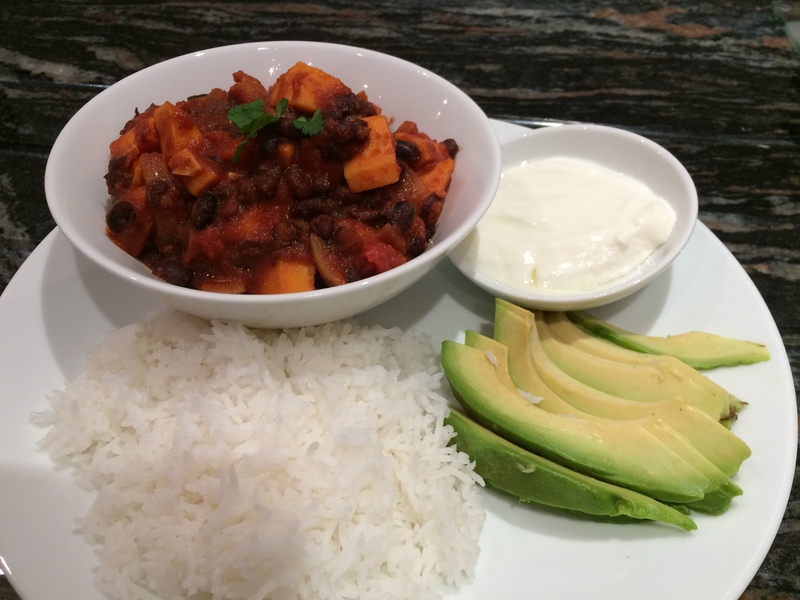 We like serving our chilli with a helping of fluffy basmati rice, sliced avocado and a bowl of homemade yoghurt. Alternatively, serve with quinoa and sour cream. Heat the oil in a large pan over a medium-high heat. Add the sweet potato and onion and cook, stirring often, until the onion is beginning to soften, about 4 to 5 minutes. Add garlic, chilli powder, cumin, cinnamon and cook, stirring constantly for 30 seconds. Add chopped tomatoes, black beans and bring to a simmer. Cover, reduce heat and simmer until the sweet potato is tender, about 20 minutes. Add the lime juice, season to taste and remove from the heat. As I had quite a few sweet potatoes in my vegetable drawer, I doubled up this recipe and it has made plenty to pop in the freezer for another day. This entry was posted in Dinner, Lunch, Vegetarian and tagged Black Beans, Chilli, Dinner, Gluten Free, Healthy Eating, Lunch, Probiotic Yoghurt, Supper, Sweet Potato, Vegetarian, Wheat-Free. Bookmark the permalink.